With the beautiful Spring weather at the moment, I was looking for a fresh, healthy but tasty recipe for dinner. I didn’t feel like salad and I had a bag of home-grown snow peas in the fridge. 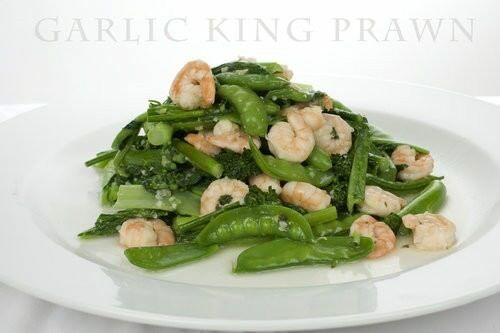 I thought back to a Chinese Classic – Stir Fried Garlic King Prawn! What I found was a recipe for Choy Sum, or stir fried Asian greens in a white sauce. It was exactly what I felt like eating, and I promise on a stack of recipe books it took under 5 minutes to make! It is so quick it would take longer to find the number for your local Chinese Restaurant than it does to cook this dish. The taste is 100% spot on and it would be just as nice with chicken. Prepare all the vegetables, washing and trimming as needed. Mix the white sauce ingredients and set aside. Heat up a wok and add the cooking oil until hot. Add ginger, and ginger stir-fry until light brown or aromatic. Add green prawns and stir until the prawns are about half cooked. 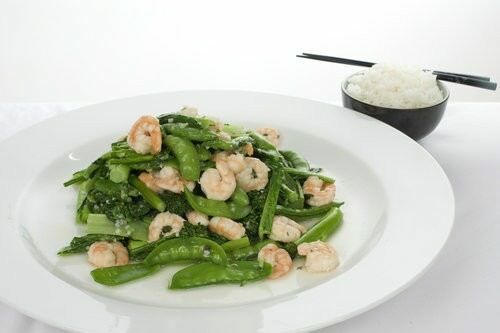 Add vegetables into the wok and stir quickly. Transfer the white sauce mixture into the wok and continue to stir-fry until the sauce thickens. The vegetables should still be crisp and cooked through. Such a tasty and light dish. The whole family loved it and I’m certain that I will make it again.